Amenhotep III (ca. 1386-1349 B.C.) - One of the major pharaoh's of the New Kingdom, Amenhotep III had a long and prosperous reign. It was also a relatively peaceful period in Egypt's history thanks mainly to Amenhotep's great-grandfather, Thutmose III. Much of the region surrounding Egypt had already been conquered and the homeland was well buffered in virtually every direction. As a result, Amenhotep III was able to turn his attention to internal matters. One mark of his peaceful reign is the numerous statues of him. Over 250, more than any other pharaoh, representing virtually every stage of his life, from youth to old age. It was also a time when trade flourished into and out of Egypt. An important discovery came in 1887 when the Amarna Letters were found. They were revealed to be from Amenhotep's royal archives and record a plethora of correspondence with neighboring kingdoms. Interestingly, they are not written in Egyptian hieratic, but Akkadian Cuneiform, suggesting that the Mesopotamian language may have been the "international" language of the time. Finally, like just about every other pharaoh, he built. The crowning achievement of his reign was the Temple of Amun at Karnak. 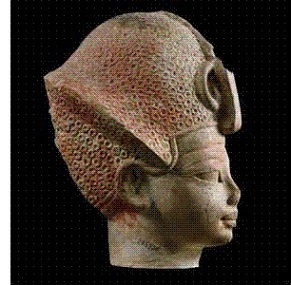 However, all the stability that Amenhotep III worked so hard to create in Egypt would be turned upside-down by his son and successor, Amenhotep IV, who would later become known as Akhenaten.